National Insurance Academy (NIA) is a premier institution devoted to equip the insurance industry with the best of talents. Its close association with the Insurance industry provides the 'real life' reference to its training, education, research and consultancy activities. NIA was established in 1980 jointly by the Ministry of Finance - Government of India, Life Insurance Corporation of India, General Insurance Corporation of India, The New India Assurance Company, National Insurance Company, United India Insurance Company and The Oriental Insurance Company on 16th December, 1980 in Mumbai to be the institute of excellence in learning and research in Insurance, Pension and allied areas.The Academy was shifted to Pune on 4th June, 1990 with the state-of-the-art facilities for learning and research. main expertise. 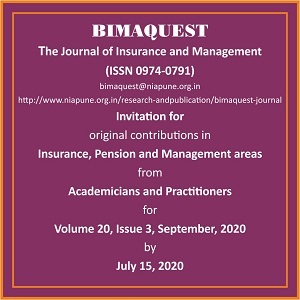 Later, the two year Post Graduate Diploma in Management course was initiated to fulfill the growing demand of skilled professionals in Insurance and Risk Management. The programme offers dual expertise in management and Insurance. The Academy has a sprawling (approximately 32 acres) campus housing the administrative, academic, hostel and residential facilities amidst lush greenery. The campus is self sufficient with a Bank, Post Office, Dispensary, Sports, Gymnasium and Swimming Pool facilities.